Politicians and the Federal Reserve System are suffocating America with debt and out-of-control government spending. Meanwhile, our once-vaunted dollar is losing purchasing power and prestige by the day, and the U.S. economy is sinking into the mud while being papered over by money printing and bailouts. Rally hundreds of thousands of concerned Americans to force the current administration to account for America's gold reserves. Work with allies in elective office to introduce legislation to support sound money policies, such as eliminating taxation on the only money mentioned in the U.S. Constitution, auditing the nation's gold reserves, auditing the nation's central bank monopoly (otherwise known as the Federal Reserve), and supporting the recognition of sound money, i.e. gold and silver, as legal tender. That's why I hope you'll support these objectives with a gift of $5, $10, $15, $25, $50, or even $100 today. With your help, we can and will build a grassroots bonfire of opposition to the policies of the Fed that are destroying our dollar and eroding our savings with the ravages of inflation. So please, support the Sound Money Defense League directly below with whatever gift you can afford right away. But if you give $10 or more, we will also send you a FREE .999 silver coin with our thanks... an emblem of the sound, constitutional money that was a cornerstone of America's greatness. Support our mission with a generous gift of $50 or more, and we'll send you FOUR of these silver coins. 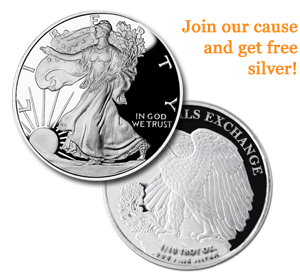 These beautiful coins (aka silver rounds) are privately minted in the U.S. exclusively for Money Metals Exchange, America's low-cost source for gold and silver. With the backing of over 100,000 paying customers, Money Metals has invested significantly in launching the Sound Money Defense League, and we'd be proud to have your support in any amount to expand this campaign to include many more Americans.